Sales of new vehicles fell 0.5 per cent to 186,993 units in March, but sales remain up 1.9 per cent through the first three months of the year, according to the Automotive News Data Center in Detroit. So far, automakers have sold 430,856 new vehicles in 2018. Several of the larger automakers, including FCA, Honda, Ford and Nissan, suffered sales declines in March. Still, David Adams, president of the Global Automakers of Canada, said the March numbers remained strong. Toyota and General Motors posted modest increases last month. Trucks once again dominated monthly sales, comprising 71 per cent of overall sales in March, compared with 67 per cent last year. Trucks represented 72 per cent of sales during the first quarter of 2018, according to the Global Automakers of Canada. The association's president, David Adams, said some consumers might have been “rattled” in March by what he called “the start of a global trade war,” as U.S. President Donald Trump slapped tariffs on Chinese steel and aluminum and continued to threaten the U.S. withdrawal from NAFTA. Adams also said there were “some flagging economic growth projections” that might have negatively affected sales. “Nonetheless, consumer confidence remains high with the Conference Board of Canada reporting that consumer confidence levels grew again in March,” said Adams. Last month’s sales were 11.4 per cent ahead of the five-year average monthly sales for March, the GAC said. General Motors led all manufacturers in March with sales of 30,159, and retained the sales crown for the first quarter with 64,931 units sold through three months. The Ford F series pickup and Honda Civic car reprised their roles as the best-selling vehicle and passenger car respectively for March 2018. General Motors Canada sold 30,159 vehicles in March, up just 0.1 per cent over the same month in 2017. The automaker’s sales were buoyed by small increases in GMC and Chevrolet sales, its two most popular brands. Sales of GMC and Chevrolet vehicles were up 1.8 and 1.3 per cent, respectively. GM sold 17,633 Chevy vehicles and 9,961 GMC vehicles in March. Chevy Suburban, Silverado, Colorado, Traverse, Trax, Spark and Volt sales were all up by double-digit percentages. Buick sales were hardest hit, down 14.2 per cent to 1,461. Cadillac sales were down 8.9 per cent to 1,104. However, GM’s total sales through three months of 2018 are up six per cent over the same period of 2017. Ford Canada’s March sales dipped 1.6 per cent to 26,487 vehicles in March, dragging its total sales down nearly three per cent through the first three months of 2018. 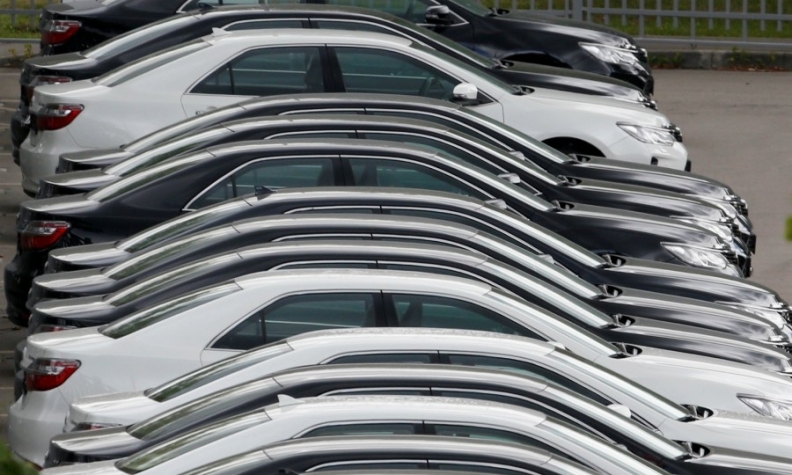 Car sales actually saved the automaker’s March numbers as they increased 1.5 per cent. Truck sales were down two per cent. Looking at individual vehicles, the Ford Edge increased sales by eight per cent, marking its best March on record. Ford Explorer sales increases 16 per cent giving the vehicle its best March since 2003. On the luxury side, total Lincoln sales were up 26.1 per cent. It was the brand’s best March and first quarter since 2011. Lincoln Navigator sales increased 391 per cent to 162 units and had its best March on record. Nissan Canada sales, including its luxury Infiniti brand, were off 3.9 per cent in March when compared with last year. Nissan brand sales were down 3.9 per cent to 13,987 vehicles while Infiniti sales fell 6.7 per cent to 1,205 units. Nissan’s best-selling vehicle in Canada, the Rogue utility vehicle, saw its sales fall 5.6 per cent to 4,616 units. Meanwhile, the smaller Nissan Qashqai compact utility vehicle reinforced its position as the second best-selling model in the Nissan lineup with 1,606 vehicles sold. Record sales for the Jeep and Ram brands couldn’t keep Fiat Chrysler Automobiles from posting a 7.7 per cent drop in March sales when compared with the same month in 2017. FCA sold 24,490 vehicles last month, down from the 26,531 it sold a year ago. Jeep and Ram brands set March sales records of 8,506 and 9,548, respectively, the automaker said. Jeep Wrangler saw its best month ever with 3,839 vehicles sold. Also setting a March record was the Jeep Compass with 1,217 vehicles sold. Chrysler Pacifica sales of 886 were the best results of any month since the vehicle launch. FCA Canada’s sales through three months of 2018 are down 4.7 per cent over the same three months of last year. Toyota Canada reported March sales of 21,040 vehicles; that number includes both the Toyota and Lexus brands. Total sales last month were up 8.4 per cent over March 2017. Toyota’s truck total, including Lexus brand trucks, was up 16.5 per cent to 13,371 vehicles. Tundra and Tacoma sales were up 17 and 37.1 per cent to 1,108 and 1,299 units, respectively. Total Toyota and Lexus car sales slid 3.3 per cent to 7,669 units sold. Corolla sales were down 11.2 per cent to 4,242. The automaker also saw sales of its Prius more than double to 631 units, up from the 228 a year ago. Hyundai Canada reported March sales of 9,739 Hyundai brand vehicles, down 12.2 per cent over the same month last year. When it came to the Genesis line, the automaker’s luxury brand, sales of 63 vehicles were reported in March. Kia Canada sold 6,802 vehicles in March, up 7.2 per cent over last year. The surge pushed the automaker’s three-month total up 0.8 per cent over last year.